Hi! Welcome to MCT's 62nd Release Sneak Peeks. There are 2 dies with this set, top and bottom layers. I used it here to make a cutout in the Just A Note die and added a sentiment from the Teeny Tag Holidays. For the bow I cutout some felt with the Fun Sized Scallop Stitched Bow die. Paper is from Doodlebug Design's 6 x 6 Here Comes Santa Claus Paper Pad. 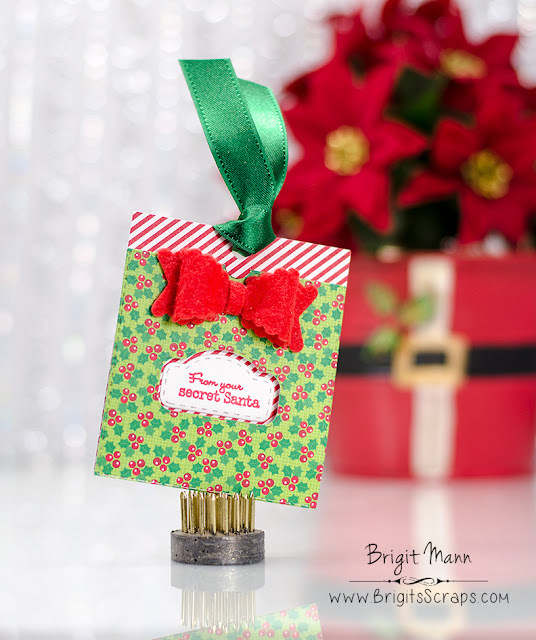 Oh Miss Brigit Your "Secret Santa" Tag is so cute I love how clever and creative you were with Miss Emma's goodies. Love the papers and your cool use of different textures and fabrics makes for a Sweet & Pretty tag. Love your ideas using todays sneak peek!! Great Creative Job!! YOU so ROCK!! This is so sweet, Brigit! I love how you used these dies to make a cut out! Super CUTE Brigit! LOVE the use of the die as a window! Adorable! Love your paper choices and details! So cute with the cut out window with the tag dies! very, very, beautiful tag . Love the felt bow stunning!!! I like your clever idea to make a cut out to reveal the sentiment...very sweet! Love the bow! the freebie die is clever. What a great idea to use this for a Secret Santa! Love the bow!!! Brigit this is adorable! I really love that sentiment so much! So cute and festive. Love the felt bow. Brigit, what a very creative idea. So cute! Sweet little dies.